Nicolás Hernán Gonzalo Otamendi (Spanish pronunciation: [nikoˈlas otaˈmendi] ; born 12 February 1988) is an Argentine professional footballer who plays as a centre back for Premier League club Manchester City and the Argentine national team. Manchester City Football Club, commonly referred to as Man City or simply City, is a football club based in Manchester, England, that competes in the Premier League, the top flight of English football. Founded in 1880 as St. Mark's , it became Ardwick Association Football Club in 1887 and Manchester City in 1894. The club's home ground is the City of Manchester Stadium in east Manchester, to which it moved in 2003, having played at Maine Road since 1923. He played for Vélez Sarsfield and Porto in his early career, winning eight major titles with the latter including three Primeira Liga championships and the 2011 Europa League. He signed for Manchester City in 2015 from Valencia (with the latter club also loaning him to Atlético Mineiro of Brazil for four months), winning the Premier League in 2017–18 as well as three League Cups. An Argentina international since 2009, Otamendi represented his country at two World Cups and as many Copas América, in which he contributed to consecutive runner-up finishes. The Primera División, named Superliga Argentina since the 2017–18 season, is a professional football league in Argentina, organised by the homonymous entity, that is administrated independently and has its own statute. Nevertheless, the Superliga is contractually linked with the main football body, the Argentine Football Association (AFA) that organized all the championships from 1893 to 2017. Club Atlético Rosario Central is a sports club based in Rosario, Argentina, that plays in the Argentine Primera División. The club was officially founded December 24, 1889 by a group of railway workers, taking its name from the British-owned Central Argentine Railway company. One of the oldest Argentine teams, it is considered a pioneer in its hometown and the only one of current Rosarian teams to have won an international title organised by CONMEBOL, the Copa Conmebol, won by the club in 1995. Arsenal Fútbol Club, usually referred as Arsenal de Sarandí[aɾseˈnal de saɾanˈdi], is an Argentine sports club from the Sarandí district of Avellaneda Partido, Greater Buenos Aires. The 2009 Copa Sudamericana de Clubes is the 8th edition of the CONMEBOL's secondary international club tournament. Internacional were the defending champions, having won the trophy the previous season. Ecuadorian side LDU Quito won the 2009 tournament, becoming the first Ecuadorian winners of the trophy. The CONMEBOL Sudamericana, named as Copa Sudamericana is an annual international club football competition organized by the CONMEBOL since 2002. It is the second-most prestigious club competition in South American football. CONCACAF clubs were invited between 2004 and 2008. The CONMEBOL Sudamericana began in 2002, replacing the separate competitions Copa Merconorte and Copa Mercosur by a single competition. Since its introduction, the competition has been a pure elimination tournament with the number of rounds and teams varying from year to year. On 23 August 2010, Otamendi was transferred to Portuguese side FC Porto on a €4 million fee, signing a five-year contract. Vélez also retained 50% of his registration rights, with the player having a pre-set price of another €4 million to be met by Porto prior to September 2011. He netted in his first match, a 2–0 home victory over S.C. Olhanense,  finishing his first season with 15 appearances and five goals (notably both in a 2–0 away win against S.C. Braga)  as the northerners won the Primeira Liga championship. Sporting Clube Olhanense is a Portuguese sports club from Olhão, Algarve. The 2010–11 Primeira Liga was the 77th season of the Primeira Liga, the top professional league for Portuguese association football clubs. It began on 15 August 2010 and ended on 14 May 2011. A total of 16 teams contested the league, 14 of which already took part in the previous season and two of which were promoted from the Liga de Honra. Benfica were the defending champions but finished runners-up to Porto, who won their 25th league title in the club's first-ever unbeaten season. Porto's forward Hulk was the top scorer with 23 goals. Sporting Clube de Braga, commonly known as Sporting de Braga or just Braga, is a Portuguese sports club from the city of Braga. Its football team plays in the Primeira Liga at the Estádio Municipal de Braga. On 6 September 2011, Porto exercised the rights to sign the remainder of Otamendi's playing rights. He played 30 official games during the season to help the club to another two major titles, notably the back-to-back domestic league. 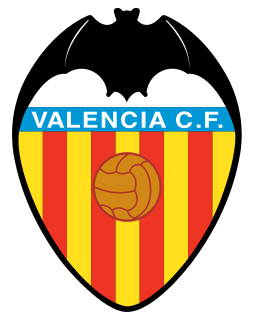 Valencia Club de Fútbol, commonly referred to as Valencia CF or simply Valencia, is a Spanish football club based in Valencia. They play in La Liga. Valencia have won six La Liga titles, seven Copa del Rey titles, two Inter-Cities Fairs Cups, one UEFA Cup, one UEFA Cup Winners' Cup and two UEFA Super Cups. They also reached two UEFA Champions League finals in a row, losing to La Liga rivals Real Madrid in 2000 and Bayern Munich on penalties after a 1–1 draw in 2001. Valencia were also members of the G-14 group of leading European football clubs. In total, Valencia have reached seven major European finals, winning four of them. 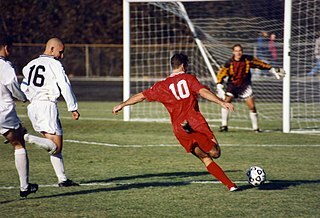 The Campeonato Nacional de Liga de Primera División, commonly known as La Liga, is the men's top professional football division of the Spanish football league system. Administered by the Liga Nacional de Fútbol Profesional, also known as the Liga de Fútbol Profesional (LFP), La Liga is contested by 20 teams, with the three lowest-placed teams at the end of each season relegated to the Segunda División and replaced by the top three teams in that division. Cristian Alberto 'Kily' González Peret is an Argentine retired footballer who played mainly as a left winger. Luis Óscar "Lucho" González is an Argentine professional footballer who plays for Brazilian club Clube Atlético Paranaense. A versatile midfielder who is able to play in different positions but mainly in the centre, he is well known for his fierce shot, passing skills and hardworking style, being affectionately known as El Comandante due to his leadership skills. Mauricio Andrés Pellegrino Luna is an Argentine retired footballer who played as a central defender, and is the manager of Spanish club CD Leganés. Lionel Andrés Messi Cuccittini is an Argentine professional footballer who plays as a forward and captains both Spanish club Barcelona and the Argentina national team. Often considered the best player in the world and regarded by many as one of the greatest players of all time, Messi has won a record-tying five Ballon d'Or awards, four of which he won consecutively, and a record five European Golden Shoes. He has spent his entire professional career with Barcelona, where he has won a club-record 32 trophies, including nine La Liga titles, four UEFA Champions League titles and six Copas del Rey. Both a prolific goalscorer and a creative playmaker, Messi holds the records for most goals scored in La Liga (408), a La Liga season (50), a club football season in Europe (73), a calendar year (91), El Clásico (26), most hat-tricks in the UEFA Champions League (8), as well as those for most assists in La Liga (165) and the Copa América (11). He has scored over 670 senior career goals for club and country. Juan Antonio Pizzi Torroja is a retired professional footballer who played as a striker, and is a manager. Cristian Gabriel Rodríguez Barotti is a Uruguayan professional footballer who plays as a left winger for Peñarol. Radamel Falcao García Zárate is a Colombian professional footballer who plays as a forward for and captains both Monaco and the Colombia national team. He is sometimes nicknamed "El Tigre" or "King of the Europa League". Enzo Nicolás Pérez Seguí is an Argentine professional footballer who plays as a central midfielder for Argentine club River Plate and the Argentina national team. Ángel Fabián Di María is an Argentine professional footballer who plays for Paris Saint-Germain and the Argentina national team. He can play as either a winger or attacking midfielder. Sebastián Enrique Domínguez is an Argentine football centre back who played for Newell's Old Boys. He has since retired. 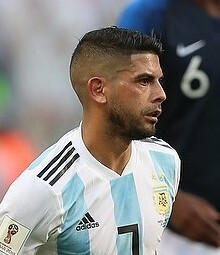 Éver Maximiliano David Banega is an Argentine professional footballer who plays for Spanish club Sevilla FC and the Argentina national team as a central midfielder. Osvaldo Nicolás Fabián "Nico" Gaitán is an Argentine professional footballer who plays for Chinese club Dalian Yifang and the Argentina national team, mainly as an attacking midfielder. Lucas David Pratto is an Argentine professional footballer who plays for River Plate as a striker. Carlos Henrique Casimiro, known as Casemiro, is a Brazilian footballer who plays as a defensive midfielder for Spanish club Real Madrid and the Brazil national team. Danilo Luiz da Silva, known simply as Danilo, is a Brazilian professional footballer who plays as a right or left-back for English Premier League club Manchester City and the Brazil national team. Francisco Román Alarcón Suárez, commonly known as Isco, is a Spanish professional footballer who plays as an attacking midfielder for Real Madrid and the Spanish national team. In 2017, he was selected as one of the 30 best players in the world for that season. ↑ "List of players under written contract registered between 01/08/2015 and 31/08/2015" (PDF). The Football Association. p. 9. Retrieved 12 February 2018. 1 2 3 "Nicolás Otamendi: Overview". Premier League. Archived from the original on 7 January 2019. Retrieved 7 January 2019. ↑ "European Champions League: Man City: Nicolás Otamendi". UEFA. Archived from the original on 7 January 2019. Retrieved 7 January 2019. 1 2 3 4 "Nicolás Otamendi: "El de Vélez es un grupo con hambre"" [Nicolás Otamendi: "Vélez is a hungry group"]. La Nación (in Spanish). 28 April 2009. Retrieved 2 October 2009. ↑ "Closing '09 statistics". Argentine Soccer. Retrieved 8 August 2010. 1 2 "Verón fue elegido como el mejor jugador de América" [Verón chosen best player in America] (in Spanish). 24CON. 31 December 2009. Retrieved 31 December 2009. ↑ "Porto sign Argentina defender Otamendi". UEFA. 23 August 2010. Retrieved 25 August 2010. ↑ "Acordo de princípio para a compra do jogador Otamendi" [Negotiations for acquisition of player Otamendi](PDF) (in Portuguese). FC Porto. 23 August 2010. Archived from the original (PDF) on 30 September 2011. Retrieved 29 August 2010. ↑ "Can anybody stop this Dragon?". PortuGOAL. 26 September 2010. Retrieved 9 November 2012. ↑ "No let-up from FC Porto and Benfica". PortuGOAL. 14 February 2011. Retrieved 9 November 2012. ↑ "Porto finalise Otamendi purchase". FIFA. 6 September 2011. Retrieved 9 November 2012. ↑ "Comunicado" [Announcement](PDF) (in Portuguese). FC Porto. 6 September 2011. Retrieved 20 September 2011. ↑ "Valencia confirm signing of Nicolás Otamendi". Inside Spanish Football. 5 February 2014. Archived from the original on 6 February 2014. Retrieved 6 February 2014. ↑ "Nicolas Otamendi jugará en Atlético Mineiro cedido por el Valencia" [Nicolas Otamendi will play in Atlético Mineiro loaned by Valencia] (in Spanish). Goal. 7 February 2014. Retrieved 14 February 2014. ↑ "Atlético goleia o América e larga na frente na semifinal do Mineiro" [Atlético thrash América and lead the Mineiro semi-final] (in Portuguese). Atlético Mineiro. 23 March 2014. Retrieved 13 June 2016. ↑ "Nicolás Otamendi". Valencia CF. Archived from the original on 21 March 2015. Retrieved 20 June 2015. ↑ Campos, Tomás (23 August 2014). "Punto de fe del Valencia" [Valencia point of faith]. Marca (in Spanish). Retrieved 3 September 2014. ↑ Bengoa, Javier (4 October 2014). "El Valencia derroca al campeón de Liga" [Valencia knock League champions out]. Super Deporte (in Spanish). Retrieved 4 October 2014. ↑ Oliver, Pete (4 January 2015). "Valencia 2–1 Real Madrid". BBC Sport . Retrieved 4 January 2015. ↑ Gimeno, Manu (23 May 2015). "Histórico 'Otakaiser': primer central che que marca seis goles en Liga" [Historical 'Otakaiser': first che stopper who scores six goals in League] (in Spanish). El Desmarque. Retrieved 8 September 2015. ↑ Skinner, Adam (17 June 2015). "Cristiano Ronaldo and Lionel Messi lead La Liga team of the year... but there's no place for Gareth Bale after disappointing season". Daily Mail . Retrieved 24 June 2015. ↑ "Otamendi se niega a jugar con el Valencia" [Otamendi refuses to play with Valencia]. Mundo Deportivo (in Spanish). 15 August 2015. Retrieved 8 September 2015. ↑ "Nicolas Otamendi joins City". Manchester City F.C. 20 August 2015. Retrieved 20 August 2015. ↑ "Nicolas Otamendi: Manchester City sign £32m Argentina defender". BBC Sport. 20 August 2015. Retrieved 20 August 2015. ↑ "Morata earns Juventus victory at Manchester City". UEFA.com. 15 September 2015. Retrieved 15 September 2015. ↑ Jurejko, Jonathan (19 September 2015). "Manchester City 1–2 West Ham United". BBC Sport. Retrieved 1 November 2015. ↑ Osborne, Chris (31 October 2015). "Manchester City 2–1 Norwich City". BBC Sport. Retrieved 1 November 2015. ↑ McNulty, Phil (28 February 2016). "Liverpool 1–1 Manchester City". BBC Sport. Retrieved 13 June 2016. ↑ Sottile, Marcelo (17 April 2009). "Bocación local" [Local bocation]. Olé (in Spanish). Retrieved 2 October 2009. ↑ "Con destellos, la Argentina venció a Panamá 3 a 1" [With flashes, Argentina beat Panama 3 to 1]. La Nación (in Spanish). 20 May 2009. Retrieved 24 November 2018. ↑ "Maradona probó con Otamendi como lateral" [Maradona tested Otamendi as fullback] (in Spanish). La Capital MdP. 11 October 2009. Retrieved 8 September 2015. ↑ "¡Acá están, estos son!" [These are the guys!]. Olé (in Spanish). 19 May 2010. Retrieved 19 May 2010. ↑ "Liniers queda en Sudáfrica" [Liniers stays in South Africa]. Olé (in Spanish). 23 June 2010. Retrieved 23 June 2010. ↑ Edwards, Daniel (4 July 2010). "World Cup 2010 Comment: Javier Zanetti or Nicolas Otamendi? The decision to snub Inter's captain cost Maradona & Argentina". Goal. Retrieved 16 July 2010. ↑ Ladyman, Ian (5 July 2010). "Diego Maradona finally exposed as Argentina's weakest link... along with their right full back". Daily Mail . Retrieved 16 July 2010. ↑ "Quiero jugar siempre aunque no sea en mi puesto" [I want to play always even if it's out of position]. Olé (in Spanish). 16 July 2010. Retrieved 16 July 2010. ↑ "La Argentina de Sabella comienza con victoria ante Venezuela en Calcuta" [Sabella's Argentina start with win against Venezuela in Kolkata]. El Comercio (in Spanish). 2 September 2011. Retrieved 1 February 2014. ↑ "Otamendi making the most of every opportunity". FIFA. 3 December 2014. Retrieved 14 June 2015. ↑ "Gerardo Martino confirmó la lista de 23 convocados y mantuvo a Casco para la Copa América" [Gerardo Martino confirmed list of 23 selected and kept Casco for the Copa América]. La Nación (in Spanish). 27 May 2015. Retrieved 27 May 2015. 1 2 "Copa América 2015 – Team of the tournament". CONMEBOL. 5 July 2015. Archived from the original on 7 July 2015. Retrieved 5 July 2015. ↑ Timms, Aaron (27 June 2016). "Chile win Copa América once again as Argentina title drought continues". The Guardian . Retrieved 27 June 2016. ↑ "Lionel Messi scores brilliant hat-trick as Argentina surge into quarter-finals". The Guardian. 11 June 2016. Retrieved 11 June 2016. ↑ "World Cup 2018: Messi and Aguero in Argentina squad but Icardi out". BBC Sport. 21 May 2018. Retrieved 23 May 2018. ↑ "Nicolás Otamendi: Club matches". worldfootball.net. HeimSpiel Medien. Retrieved 25 November 2018. 1 2 3 4 5 6 7 8 9 10 11 12 "N. Otamendi". Soccerway. Perform Group. Retrieved 12 August 2018. ↑ "Games played by Nicolás Otamendi in 2015/2016". Soccerbase. Centurycomm. Retrieved 27 January 2019. ↑ "Games played by Nicolás Otamendi in 2016/2017". Soccerbase. Centurycomm. Retrieved 11 February 2018. ↑ "Games played by Nicolás Otamendi in 2017/2018". Soccerbase. Centurycomm. Retrieved 12 August 2018. ↑ "Games played by Nicolás Otamendi in 2018/2019". Soccerbase. Centurycomm. Retrieved 27 January 2019. 1 2 "Nicolás Otamendi". National Football Teams. Benjamin Strack-Zimmerman. Retrieved 25 November 2018. ↑ McNulty, Phil (25 February 2018). "Arsenal 0–3 Manchester City". BBC Sport. Retrieved 25 February 2018. ↑ Bevan, Chris (5 August 2018). "Chelsea 0–2 Manchester City". BBC Sport. Retrieved 6 August 2018. ↑ "The 2014/15 Liga BBVA Ideal XI". Liga de Fútbol Profesional. 15 June 2015. Retrieved 17 June 2015. ↑ "Awards". Copa América 2016. Archived from the original on 27 June 2016. Retrieved 29 January 2018. ↑ "Manchester City players dominate PFA team of the year". BBC Sport. 18 April 2018. Retrieved 19 April 2018. 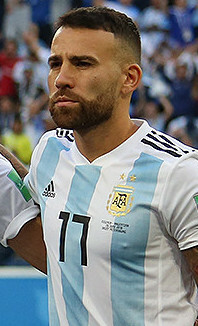 Wikimedia Commons has media related to Nicolás Otamendi .